Reading Nancy Drew books fed my young imagination with a much-needed female character who’s intelligent, gutsy, clever, and resourceful while she solved mysteries, fighting the “bad guys” and helping the oppressed. A real heroine. Luz is a similar role model for modern girls in an action-packed graphic novel Luz Sees the Light (great pun: Luz means “light” in Spanish). She’s an energetic young teen who becomes increasingly aware of troubles in her environment. Sure, we get a slice of her life in the city—going to school, meeting a new kid in the neighborhood. And she’s a typical teen consumer saving her money to buy some cool shoes. But she ends up walking to the mall with a friend after her mom refuses to drive her due to high gasoline prices. An electricity blackout becomes not just a silencer of electronic toys, but an opportunity to hang out with friends face-to-face. Luz finds herself attracted to the quiet of a trashed-filled abandoned lot, and imagines what it could be—how about a park for the neighborhood? And she’s inspired by resourceful DIY neighbors growing veggies in their small garden and re-using stuff. Unbeknownst to her family, she gets the city’s permission to clean up the lot. Her friends join in to remove trash, add plants and a concert area. At the big unveiling of the new park, her mom is surprised and delighted. And their new park becomes a start for community-building in the neighborhood for young and old. Refreshing dynamic graphics, a likeable character, and an engaging story to promote sustainable living for an fossil fuel-constrained world. Since I’m not a mom, a teacher, or a librarian, I’m curious to know how young readers respond to the book. Is her transformation into environmental awareness believable and admirable? Would her changes inspire real kids to take the initiative like she does? I want to share it with some young someone(s) in the intended audience, and get their responses. Any takers? Email me! 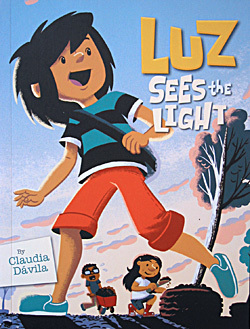 Luz Sees the Light is the first book in a series, The Future According to Luz from Canadian author/illustrator Claudia Davila from Kids Can Press. I hope Luz gains a big following—readers who follow her lead to change the world for the better.